IF Accreditation@IDA could be represented by a hashtag (or two), #SupportLocal or #BuySingapore would be it. The scheme - launched by the Infocomm Development Authority of Singapore (IDA) in July 2014 to accredit and help promising homegrown tech companies clinch more government work - has since created S$20 million in government project opportunities for eight such companies. All of them say the accreditation has boosted their credibility, confidence and access to not just the public sector, but large corporations as well. The eight companies are Deep Identity, Green Koncepts, Inspire-Tech, KAI Square, Latize, Tagit, Trakomatic and V-Key. "When you have something new, cutting-edge, Singapore customers tend to want to put you in a box," Latize co-founder Vikram Mengi told BT. "If they don't find you in a clearly defined category space, they find it hard to deal with you. Customers here do not fit into the 'innovators' segment and prefer to be 'followers' of tested products and solutions. Accreditation@IDA helps customers feel they are not taking such a big risk and paves the way for greater innovation within the government." Founded in 2009, Latize has created Ulysses, a "revolutionary" semantic-linked data software that infuses intelligence into the data itself instead of at an application level, letting companies make better informed decisions faster, said Mr Mengi. It is currently working on projects with the Singapore Economic Development Board (EDB), National Library Board and IDA, and is in discussion with several agencies to develop solutions in marketing and stakeholder management as well as fraud detection. Accreditation@IDA streamlines the government procurement process such that accredited companies will be considered first for projects by government agencies. As at July 2015, the scheme has lined up some 125 projects from 50 government agencies. Said IDA executive deputy chairman Steve Leonard: "Just a year ago, we laid out a huge challenge to our team: How can we support young companies with great ideas and products in meaningful ways that can grow their business, and bring new innovation into government services?" Observers have labelled the scheme a positive affirmative action, drawing parallels with the US, where the Obama administration recently joined a push to boost diversity in the tech sector by announcing commitments by venture capitalists and Silicon Valley firms to hire and promote more women and minorities. Take, for instance, mobile solutions startup Tagit, whose platform MOBEIX was already being used by regional banks before accreditation. "We wanted to expand to another vertical, and the accreditation has helped us enter the government sector," said CEO Sandeep Bagaria. He added that IDA would conduct a thorough due diligence on the company. "From this, you can identify the strengths and weaknesses of your product and enhance it as needed. IDA is also very proactive on the go-to-market front, connecting government agencies with requirements to companies with relevant solutions. So it's not just a passive certificate but a team behind it that is actively showcasing your company." Benjamin Mah, co-founder of mobile security firm V-Key, agreed: "IDA's process is focused on understanding the company and our products, with the sole objective of helping us grow. It is not a typical checklist examining to pass or fail us, but partnering us to address gaps." An inventor of mobile virtual secure element cryptography, V-Key helps enterprises enhance the security of their mobile apps, making the latter threat-aware and self-defending against malicious attacks. Said Mr Mah: "Thanks to the accreditation, we have entered into an agreement with a global security player." For Green Koncepts, an energy management company, the accreditation has boosted its pace of innovation and instilled greater confidence in its private sector customers. Founder Kenneth Lee said: "It gives us a level playing field with larger companies, and will help us build a strong customer base in Singapore to drive international expansion." The latter seems almost an inescapable strategy for Singapore firms. Said Trakomatic chief executive Allen Lin: "The Republic is constrained by its small size and lack of immediate access to global markets. It is hence important for startups to craft viable approaches to penetrate regionally and globally." He added that the accreditation has accelerated the startup's growth path; it is now looking to take its real-time video tracking solutions to Asean and China next. 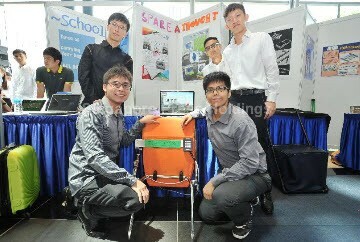 KAI Square, a fellow video analytics player whose clients include the Land Transport Authority of Singapore (LTA) and Housing Development Board (HDB), said as much: "(After the accreditation), we've noticed more organisations asking for video analytics and, surprisingly, they understand the capabilities it offers. Startups need to constantly formulate dynamic strategies and be more versatile as the Singapore market is small, and requirements for products are often unique to it." Despite the constraints, Cassandra Lai of mobile solutions firm Inspire-Tech, which is now working with government agencies in facilitating paperless boardroom meetings as well as secure file-sharing with external parties, is hopeful. "In general, Singapore startups are resourceful and resilient. The ecosystem is at a vibrant stage, with stronger support and funding from both private investors and the Singapore government. Along with a greater tolerance for failure now, this cultivates a positive mindset and encourages more entrepreneurial pursuits." Of these pursuits, "very good ideas", particularly in commercial or enterprise class solutions, have emerged, noted Siva Belasamy of Deep Identity, an identity governance and administration startup whose customers include the Singapore Police Force, Ministry of Manpower, and Senoko Power. He said the accreditation has been a confidence booster for his team, and urged startups to participate in the scheme. These eight companies, following the increased traction with government agencies and large corporations, are said to be growing their staff strength by over 85 per cent over the next two years. By March 2016, the goal is to have a total of 20 accredited companies, said IDA.